FALL RIVER, Mass. — Southcoast Health announced today that it has launched its Hope Rocks Project, an initiative that will remind patients that they are not alone in their fight against cancer. 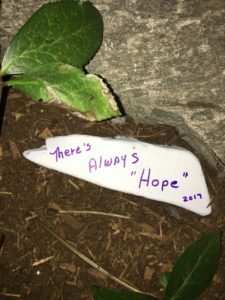 A Hope Rock was found recently in the garden near the front door to the Southcoast Health Women’s Center at 300B Faunce Corner Road in Dartmouth. Patients and visitors at the Southcoast Centers for Cancer Care in Fall River and Fairhaven will be asked to draw a picture, write a message or add a few a simple words to a small rock. The patient or visitor will then be asked to take the rock and find a spot to leave it in the community over the course of their day. “We hope this project will continue for many years to come,” added Tsonis. For more information on the Hope Rocks Project, contact Kathy Tsonis at 508-973-3077.